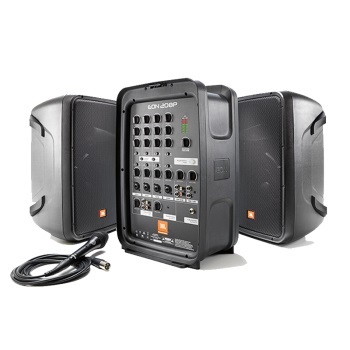 Get legendary sound quality with the EON208P all-in-one portable PA system, complete with an 8-channel mixer and Bluetooth audio. With a convenient suitcase-style design, the EON208P makes it easy to get great sound for performances, meetings and events. The 8-channel detachable mixer provides professional connections for mics, instruments and line-level sources, while the 8” two-way stereo speakers deliver best-in-class audience coverage. Bluetooth connectivity also allows you to stream audio from your mobile device. With 300 watts, you’ll have more than enough volume to be heard. Plus, the compact and lightweight form factor means you can carry the entire system with one hand.